In the whole wide world of culinary combinations, few things enjoy the legendary pairing made famous with wine and cheese. In the fall, two local business people began combining their respective expertise in each of these, and the resultant Wine and Cheese Society of New Canaan looks to serve flavorful results. 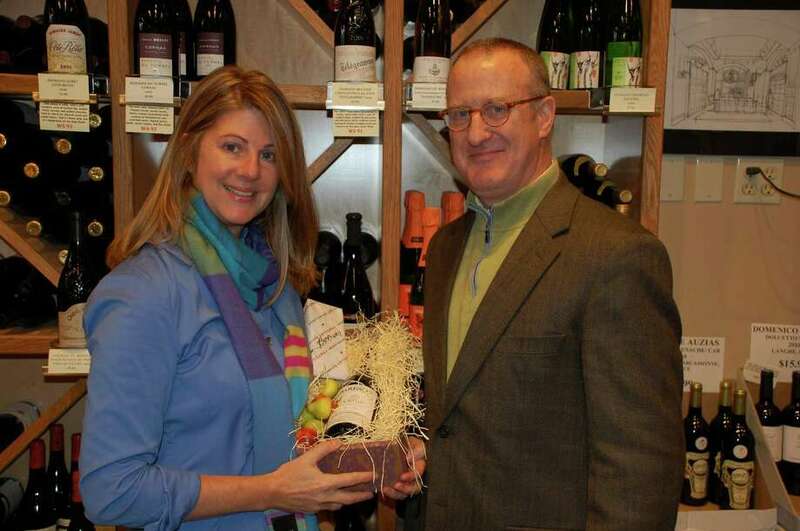 "It all started with our education program here at the store," said Jeff Barbour, owner of New Canaan Wine Merchants, who has conducted monthly wine lectures since opening the store four years ago. Last year, however, stringent no-food laws for package stores were finally changed to allow the sales and serving of cheeses -- and cheeses only, Barbour said. Thus, he enlisted Erin Hedley, who operates La Dame du Fromage -- a planning, education and consulting business for artisanal cheese, those that are most finely produced, and ever growing in popularity. "Erin and I have done events together, so I thought it would be a nice start to invite her to do cheese events here, where she teaches people about cheese," said Barbour, who has worked with wine in various capacities for 30 years, beginning with a job as wine program director for Chef Emeril Lagasse's New Orleans' restaurant Commander's Place. "It's a whole culture," he said, "enjoying food and wine ... Meat and wine are mutual cousins and putting them together always makes it special." Hedley began her affection and affiliation with cheese following a class in New York City eight years ago. "The instructor was so passionate about what she did," she said. "It was just fascinating to me." This led her to continue studies with the Artisanal Premium Cheese Center in Manhattan, where she now teaches a variety of classes. "Wine and cheese has always been very closely knit together," Barbour said. "Most of the better wine-producing areas on Earth also produce great cheeses." Out of the joint classes came the idea to sell a monthly "Perfect Pairing Combination," which features a wine and cheese package. "Jeff likes to have the cheese and wine represented in the best possible way," Hedley said, with the joint classes proving an excellent venue to do so. "They're interactive. They're intimate and they're social." "During several of the wine and cheese classes, people suggested that we start some kind of club," Barbour said. Still in its early planning stage, the idea is to give a portion of proceeds from sales to a charity -- most likely the New Canaan Food Pantry. Beginning in March, Hedley and Barbour intend to host quarterly society meetings, where the means and methods of becoming a charitable organization can be formulated. "Since we're a food-based thing, we thought, `Why not give to the food pantry," Hedley said. "We're going to bill these meetings as true meetings, if we're going to set this up to accomplish something," said Barbour, explaining that they plan to set up the society up as a nonprofit organization. "Maybe we'll do events and raise money," he said, with the possibility still open that they could contribute to more than one charity. "Jeff is a huge supporter of many charities in town," Hedley said. "He's one of the most charitable retailers that I've come across."